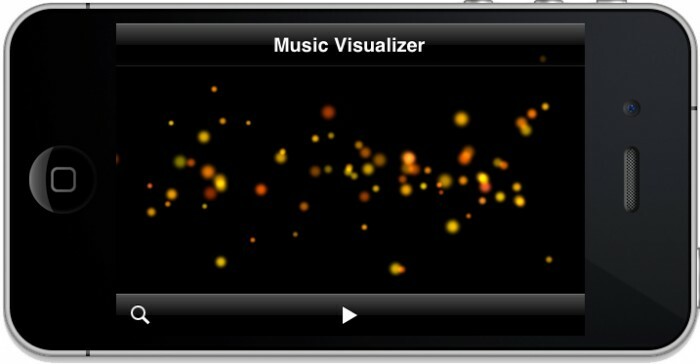 This tutorial shows you how to make your own music visualizer. You’ll learn how to play music with background audio, and make a particle system that dances to the beat of a song! In the mid-seventies, Atari released the Atari Home Music player that connected a television to a stereo and thereby produced abstract images in sync with the music. Consumers could manipulate the images by twisting knobs and pushing buttons on the device. The device was a market failure but it was the first time that the world was exposed to music visualization. Now, music visualization is a common technology that can be found in almost every digital media player such as iTunes or Windows Media Player. In this tutorial, you’ll create your very own music visualizer. You’ll learn how to configure the project to play music as well as support background audio and to create particle effects using UIKit’s particle system. You’ll also learn how to make those particles dance to the beat of a song. So cue up the music and break out the disco ball, things are about to get visual! Note: You can try out most of the tutorial using the iPhone Simulator, but you will need to run the project on a device to select different songs and to play the music in the background. It provides a simple user interface for the application. The supported interface orientation is set to landscape. The MediaPlayer.framework has been added to the project. It contains a method which allows you to pick songs from your iPod library. An image named particleTexture.png was added to the project for use by the particle system. The MeterTable.h and MeterTable.cpp C++ files were also added to the project. These were taken from the Apple sample project avTouch, and will be explained later on in this tutorial. You can tap the play button to switch between play and pause modes but you won’t hear any music until after you’ve added some code. Tap on the black area in the middle to hide/show the navigation bar and tool bar. This is because the iPhone Simulator doesn’t support accessing the music library. 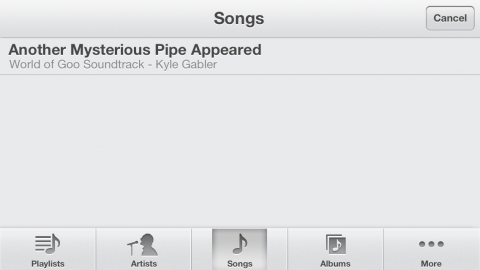 But if you are running on a device, a tap on that icon will make the media picker appear, so that you can choose a song. Once you are familiar with the user interface, let’s get started. Using AVAudioPlayer is an easy way to play music on an iOS device. AVAudioPlayer can be found in the AVFoundation.framework, so you need to add this framework to your project. Note: If you are interested in learning more about the AVAudioPlayer class and what it can do, take a look at our Audio 101 for iPhone Developers: Playing Audio Programatically tutorial. 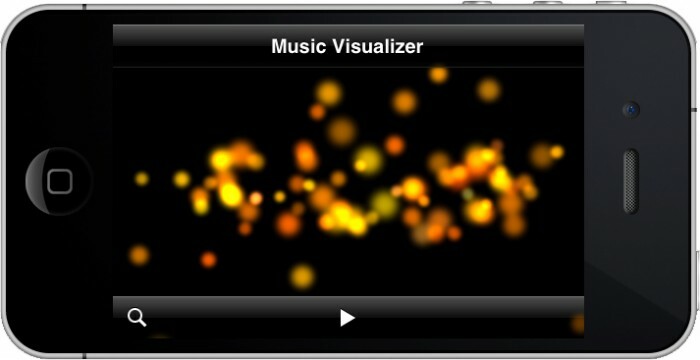 Select iPodVisualizer in the Project Navigator and then select iPodVisualizer under TARGETS. Choose the Build Phases tab, expand the Link Binary With Libraries section, then click the + (plus) button. Search for AVFoundation.framework in the pop up list, select it, and click Add. The framework should now appear in your project. // Add the following under the comment that reads "Add properties here"
This imports the AVFoundation.h header file so you can access AVAudioPlayer, and then adds a property that will hold the AVAudioPlayer instance your app will use to play audio. And now, it’s time to play a music file. This method creates a reference to the music file and stores it as an audioFileURL. 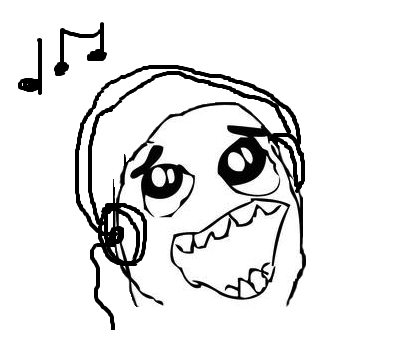 It then create a new AVAudioPlayer instance initialized with the audioFileURL and sets its numberOfLoops property to -1 to make the audio loop forever. Note: If you decide to use a music file other than the provided one, do remember to add the new file to the Xcode project and to change the music file name (and perhaps the extension) in the above method. By calling configureAudioPlayer: in viewDidLoad:, you set up the audio player as soon as the view loads and so are able to press the play button on app start and have the app play your song. Tapping the play/pause button calls playPause. The code you just added tells audioPlayer to play or pause according to its current state as defined by _isPlaying. As the name indicates, this property identifies whether the audio player is currently playing audio or not. Now build and run. If you did everything correctly the app will look exactly the same. But now you can play/pause your music. A music player that just plays one song, no matter how cool that song may be, isn’t very useful. So you’ll add the ability to play audio from the device’s music library. If you don’t plan on running on a device, or know how to set that up already, you can skip to the next section. The starter project you downloaded is set up so that when the user chooses a song from the media picker, a URL for the selected song is passed to playURL: inside ViewController.m. Currently, playURL: just toggles the icon on the play/pause button. The above code is much the same as what you wrote in configureAudioPlayer. However, instead of hardcoding the filename, you create a new AVAudioPlayer instance with the URL passed into the method. Build and run on a device, and you’ll be able to choose and play a song from your music library. While running the project on a device, press the home button. You’ll notice that your music is paused. 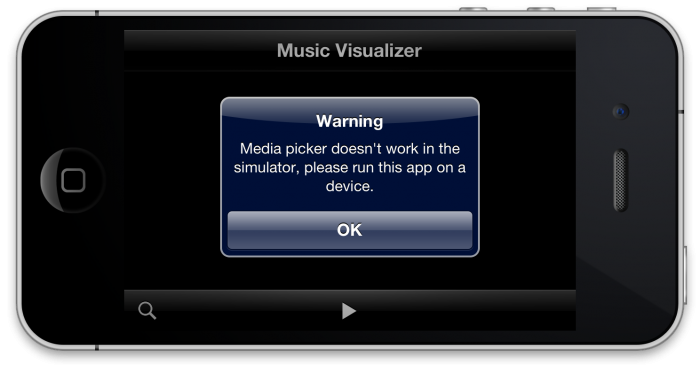 This isn’t a very good experience for a music player application, if a music player is what you’re after. You can configure your app so that the music will continue to play even when the app enters the background. Keep in mind that this is another feature not supported in the iPhone Simulator, so run the app on a device if you want to see how it works. To play music in the background, you need to do two things: set the audio session category, then declare the app as supporting background execution. First, set the audio session category. An audio session is the intermediary between your application and iOS for configuring audio behavior. Configuring your audio session establishes basic audio behavior for your application. You set your audio session category according to what your app does and how you want it to interact with the device and the system. In configureAudioSession, you get the audio session using [AVAudioSession sharedInstance] and set its category to AVAudioSessionCategoryPlayback. This identifies that the current audio session will be used for playing back audio (as opposed to recording or processing audio). This calls configureAudioSession to configure the audio session. Note: To learn more about audio sessions, read Apple’s Audio Session Programming Guide. Or take a look at our Background Modes in iOS Tutorial which also covers the topic, albeit not in as much detail. Now you have to declare that your app supports background execution. When you are done, build and run on a device, pick a song and play it, press the home button, and this time your music should continue to play without interruption even if your app is in the background. 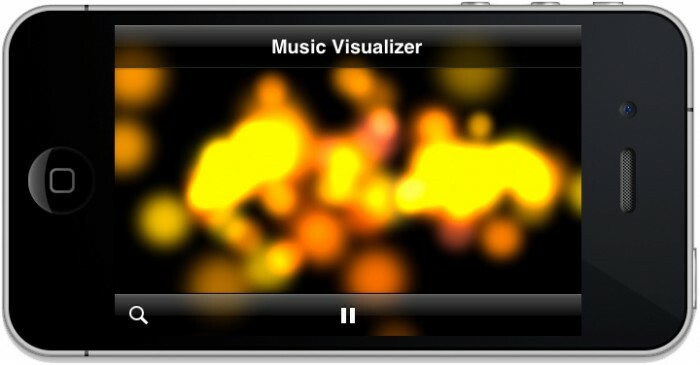 Your music visualizer will be based on a UIKit particle system. If you don’t know much about particle systems, you may want to read UIKit Particle Systems In iOS 5 or How To Make a Letter / Word Game with UIKit: Part 3/3 to familiarize yourself with the necessary background information; this tutorial does not go into detail explaining the particle system basics. First, add the QuartzCore.framework to your project (the same way you added the AVFoundation.framework). Now choose File/New/File…, and select the iOS/Cocoa Touch/Objective-C class template. Name the class VisualizerView, make it a subclass of UIView, click Next and then Create. Select VisualizerView.m in the Xcode Project Navigator and change its extension from .m to .mm. (You can rename it by clicking the file twice slowly in the Project Navigator. That is, do not click it fast enough to be considered a double-click.) The .mm extension tells Xcode that this file needs to be compiled as C++, which is necessary because later it will access the C++ class MeterTable. Overrides layerClass to return CAEmitterLayer, which allows this view to act as a particle emitter. Shapes the emitter as a rectangle that extends across most of the center of the screen. Particles are initially created within this area. Creates a CAEmitterCell that renders particles using particleTexture.png, included in the starter project. Sets the particle color, along with a range by which each of the red, green, and blue color components may vary. Sets the speed at which the color components change over the lifetime of the particle. Sets the scale and the amount by which the scale can vary for the generated particles. Sets the amount of time each particle will exist to between .75 and 1.25 seconds, and sets it to create 80 particles per second. Configures the emitter to create particles with a variable velocity, and to emit them in any direction. Adds the emitter cell to the emitter layer. Again, read the previously mentioned tutorials if you would like to know more about the fun things you can do with UIKit particle systems and how the above configuration values affects the generated particles. While that looks very cool indeed, you want the particles to “beat” in sync with your music. This is done by changing the size of particles when the decibel level of the music changes. The new property will give your visualizer access to the app’s audio player, and hence the audio levels, but before you can use that information, you need to set up one more thing. Switch to ViewController.m and search for setNumberOfLoops. If you skipped the section about running on the device, it will appear only once (in configureAudioPlayer); otherwise, it will appear twice (in configureAudioPlayer and in playURL:). With the above code, you instruct the AVAudioPlayer instance to make audio-level metering data available. 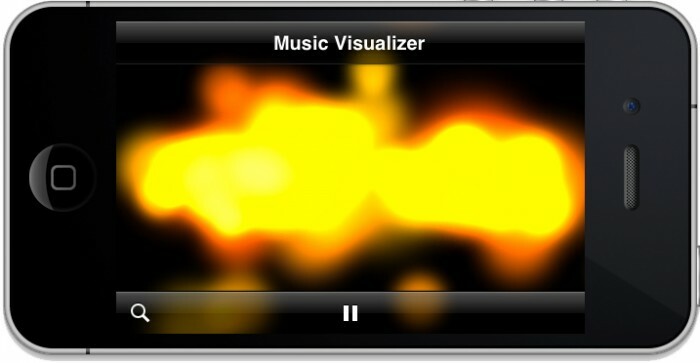 You then pass _audioPlayer to the _visualizer so that it can access that data. The above code gives you access to a MeterTable instance named meterTable. The starter project includes the C++ class MeterTable, which you’ll use to help process the audio levels from AVAudioPlayer. You’ve most likely seen something similar on the front of a sound system, bouncing along to the music. It simply shows you the relative intensity of the audio at any given time. MeterTable is a helper class that can be used to divide decibel values into ranges used to produce images like the one above. You will use MeterTable to convert values into a range from 0 to 1 and you will use that new value to adjust the size of the particles in your music visualizer. You set scale to a default value of 0.5 and then check to see whether or not _audioPlayer is playing. If it is playing, you call updateMeters on _audioPlayer, which refreshes the AVAudioPlayer data based on the current audio. This is the meat of the method. For each audio channel (e.g. two for a stereo file), the average power for that channel is added to power. The average power is a decibel value. After the powers of all the channels have been added together, power is divided by the number of channels. This means power now holds the average power, or decibel level, for all of the audio. Here you pass the calculated average power value to meterTable's ValueAt method. It returns a value from 0 to 1, which you multiply by 5 and then set that as the scale. Multiplying by 5 accentuates the music's effect on the scale. Note: Why use meterTable to convert power's value? The reason is that it simplifies the code that you have to write. Otherwise, your code will have to cover broad range of values returned by averagePowerForChannel. A return value of 0 indicates full scale, or maximum power; a return value of -160 indicates minimum power (that is, near silence). But the signal provided to the audio player may actually exceed the range of what's considered full scale, so values can still go beyond those limits. Using meterTable gives you a nice value from 0 to 1. No fuss, no muss. Finally, the scale of the emitter's particles is set to the new scale value. (If _audioPlayer was not playing, this will be the default scale of 0.5; otherwise, it will be some value based on the current audio levels. Here you set up a CADisplayLink. A CADisplayLink is a timer that allows your application to synchronize its drawing to the refresh rate of the display. That is, it behaves much like a NSTimer with a 1/60 second time interval, except that it's guaranteed to be called each time the device prepares to redraw the screen, which is usually at a rate of 60 times per second. The first line you added above creates an instance of CADisplayLink set up to call update on the target self. That means it will call the update method you just defined during each screen refresh. The second line calls addToRunLoop:forMode:, which starts the display link timer. Note: Adding the CADisplayLink to a run loop is a low-level concept related to threading. For this tutorial, you just need to understand that the CADisplayLink will be called for every screen update. But if you want to learn more, you can check out the class references for CADisplayLink or NSRunLoop, or read through the Run Loops chapter in Apple's Threading Programming Guide. Now build, run, and play some music. You will notice that particles will change their size but they don't "beat" with the music. This is because the change we make can not affect the particles that already exist on the screen. Only new particles are changed. Build and run, you will see the particle system works the same as it did before - but it still doesn't beat to the music. You can try setting birthRate to 30 to help you understand how the setting works (just don't forget to set it back to 60). So how do you get the particle system to beat to the music? Now build and run, you will see that all the particles beat with your music now. So what did the above change do? Particles are created and destroyed at the same rate as a screen refresh. That means that every time the screen is redrawn, a new set of particles is created and the previous set is destroyed. Since new particles are always created with a size calculated from the audio-levels at that moment, the particles appear to pulse with the music. 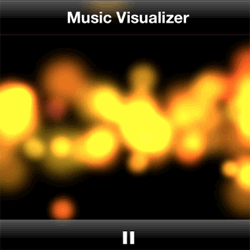 Congratulations, you have just made a cool music visualizer application! Here is the complete example project with all of the code from the above tutorial. You can add more music controls to make the project a fully functional music player. You could create a slightly more sophisticated visualizer that modified a separate particle system for each audio channel, rather than blending all audio channels into a single value. Or maybe try changing the shape of your emitter layer and moving it around within the view. While you're at it, check out Apple's sample project aurioTouch2. It's an advanced use of music visualization and a great way to learn more about the subject.